Andrew Mulenga's Hole In The Wall: Are Zambian authors underrated? Last week, the World Intellectual Property Organisation (WIPO) in collaboration with the Ministry of Information and Broadcasting Services through the Zambia Copyright Office held a two day seminar inviting about forty literary authors, publishers and interested parties. Held at Mika Lodge in Lusaka, the roundtable was overseen by Sonia Cruickshank, Senior Program Officer, Copyright Development Division, WIPO in Geneva and among other key visiting speakers were Dora Makwinja head of the Copyright Society of Malawi (COSOMA) and Greenfield Chilongo Executive Director, Zimbabwe Reproduction Rights Organisation (ZIMPCOPY). Over a two day period, the seminar participants discussed local and foreign copyright laws, effective management of copyright and benefits for developing countries as well as managing use of content in the digital environment. During her presentation, the Zambia Copyright Office deputy registrar Grace Kasungami explained that government had realised that most writers and publishers were not aware they were required to either have their books registered at her office, with the Zambia Reprographic Rights Society (ZARRSO) or deposited at the National Archives. ZARRSO was set up a couple of years ago aimed at “Rewarding authors and publishers for the reproduction of their works”. Nevertheless, as smooth sailing as the deliberations might have been, a number of unprecedented issues seeped through the dialogues to take centre stage. Key among these were a general feeling that they (Zambian authors) are not appreciated locally, uncertainty with regards the opportunity for them to market their work to the world during the UNWTO, as well as a mood that they too need to benefit from the security holograms that are soon to be introduced to audio and video compact discs. “Most writers do not know that they are supposed to deposit a book with anyone except take them directly onto the market I don’t know how the ministry can help to spread that information and tell the writers the benefits of doing it,” explained Zambia Women Writers Association’s (ZAWWA) Malia Mzyce Sililo following Kasungami’s address. Sililo light-heartedly said if Zambian writers were that bad, it is better to give the badly written books to the younger generation whom by being exposed to the bad work may feel ashamed, yet inspired and try to improve on them out of patriotic pride. The author of Picking up the Pieces as well as several English school text books also revealed that ZAWWA has in its possession over 50 manuscripts, but she wonders where they are going to take them, the cost of printing and publishing being uncontrollably exorbitant here in Zambia. She publishes with MK Publishers of Uganda who do not demand an upfront payment. But Theresa Phiri, a planner in the Ministry of Education, assured the gathering that things are not as bad as Sililo had put them and that there was still hope for Zambian authors. “The other day I walked into a bookstore to buy books for my grandson who is in Grade four and my daughter who is in Grade 11, all the books that are being used in schools are written by Zambians,” narrated Phiri “I bought all the subjects and every single one of them was written by a Zambian except for the ones in English literature. I bought Animal Farm, The Concubine and Things Fall Apart, but I just want to commend the Zambian writers also”. By the same token, Mabvuto Zulu a representative of Longman Zambia, the educational book publishers claimed that there are a lot of books in the works. Perhaps unintentionally, Zulu indicated that Longman demand what may be very prohibitive standards, this may probably be linked to Sililo’s earlier concerns where she claimed the neglect of Zambian writers. Zulu almost certainly amplified Sililo’s worries, which brings to thought; are Zambian authors really any good? None of them have been introduced into the Schools literature in English syllabus, even as we approach the nation’s fiftieth independence anniversary the accepted standard is that mostly written by West African writers and the now transcendent George Orwell and William Shakespeare. It solicits the long-lasting question; Are Zambian authors worth reading? 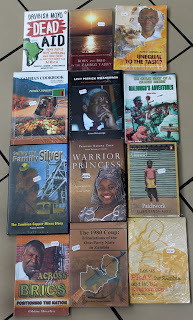 Nevertheless, whether or not Zambian authors ­­ ­– particularly the fiction writers – are managing to infiltrate classrooms and libraries, one thing that is for sure is that they do have a very strong presence in book stores. 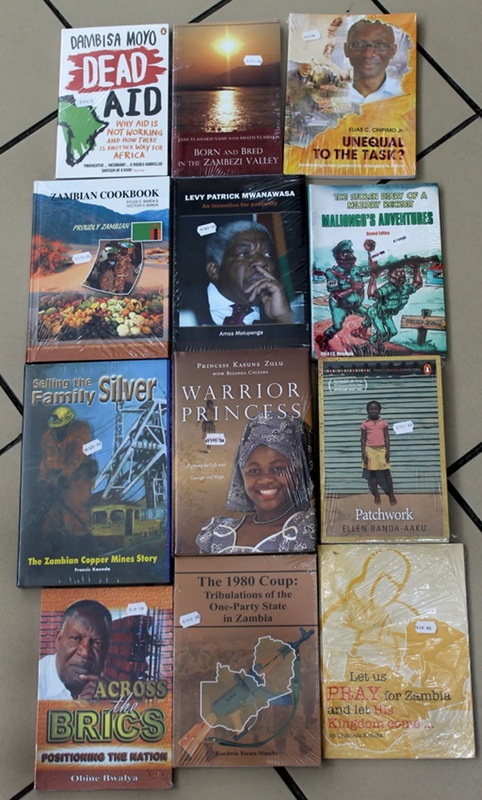 Taking a visit to Planet Books, a bookstore at the Arcades Shopping Centre in Lusaka one discovers an array of titles by Zambian authors, based home and away which reveals that they have been quite busy, writing on various topics from cookery to economics, politics to poetry and so on. Unlike the empty library shelves described by Sililo, on these you find Dambisa Moyo’s critically acclaimed Dead Aid, Ellen Banda-Aaku’s Patchwork which won the 2010 Penguin Prize for African writers an accolade she holds among many that also includes a Macmillan Writers Prize for Africa. There is also Zambian Cookbook by Sylvia C. Banda and Hector Banda, Born and Bred in the Zambezi Valley by Jane Vlahakis Nash and Shatis Vlahakis, Unequal to the task by Elias Chipimo Junior, Across the brics, positioning the nation by Obine Bwalya, Let us pray for Zambia and let his Kingdom come by Chishala Kateka as well as Information and Broadcasting Permanent Secretary Amos Malupenga’s Levy Patrick Mwanawasa: an incentive for prosperity. Anyhow, during last week’s gathering Alick F. C. Musonda the author of 15 books including Tourist Guide to Street Lingua-Franca, the hilarious Maliongo's Adventures series and some local language titles raised a concern on how Zambian authors can get their books to Livingston during the UNWTO. “Foreigners (visiting delegates) will want to know what is happening in the mind of a Zambian, and the only way they can really do this is through our literature” he said. Representing government, the Zambia Copyright Office staff present referred Musonda to the National Arts Council (NAC) who will be coordinating the display of books, photographs, music CD’s and DVD’s, fabrics, prints, paintings, sculptures, basketry, jewelry and semi-precious stones at various venues during the general assembly. Responding to this, one attendee questioned how much coordination there is between the ministry of information and broadcasting services and what he described as the “newly created, possibly active but obviously lopsided towards tourism, Ministry of Tourism and Arts” because if they want to work in isolation they will not get anything done particularly with regards the holograms. “Although that one is outside this meeting, there is a lot of coordination, you may wish to know that most of our creative arts from the creative industry are coming from tourism and we have a task force specifically for the holograms which is in fact chaired by the NAC chairperson Mulenga Kapwepwe herself” interjected Kasungami on behalf of government. During the seminar it was also learned that the much talked about holograms to be introduced in September on audio visual products will not mean an immediate curb of piracy. “For Malawi, how far we are in terms of fighting piracy, we faced the same challenges you same ones you have. We already have the hologram, but it’s limited to sound recording, we learned from Ghana, but are now ahead of them because their pirates were clever, they were able to copy the holograms,” explained Malawi’s Makwinja an anti-piracy devotee who is also the only African board member of the International Federation of Reproduction Rights Organisations (IFRRO). “In 1999 we changed so the one we are using now has more advanced features, but we have only applied it to local work and not imported work. We have moved to audio-visual work and we are now in the process of negotiating with book publishers who have also been demanding for the hologram as you are doing here in this meeting”. The issue of the hologram was heated throughout the seminar with attendees showing scepticism as to whether it will be a success even on the audio visual publications. Others saw it as a losing battle citing the widespread digital file sharing and the fact that every market place in the country has small shops with posters that read “CD burning done here”. In some of these shops the latest MP3 music files can go for as little as 50ngwee whereas the latest Hollywood movies go for K3 even before they premier in local cinemas. It was also mentioned that the younger generation were the largest culprits because it was not uncommon to find a 15-year-old with over 1,000 songs compressed on their mobile phones yet they do not even know the shelf price of a CD in a music store. But closing the deliberations, Kasungami assured all the participants that there is still room to address all the issues that were raised. “We will be having plenary sessions and round tables and this is just the first of its kind, just the beginning so you can at least give government credit, besides that you can knock on our door twenty four hours” she said “We are using a very old copyright act only a small portion was amended for the hologram. There are plans to have the whole act amended. Where you see we are not working you can push us and make us work. Let’s start identifying what issues we want amended in the act, this is just the beginning “. And as a closing word of advice to the authors and publishers from Cruickshank, who is a lawyer by profession, she advised them all to take their work very seriously and ensure that it is well preserved for their own personal copyright records and for future generations to enjoy. “It really is important for your culture to be maintained through books. If the books are deposited in the national archives it is the only historical way of knowing who has done what,” advised Cruickshank. Meanwhile, in closing the seminar, Kenneth Musamvu, the registrar of copyrights thanked all for attendance deeming the meeting a great success and assuring them all that government will look into all the issues that had been raised. Great article, indeed we need lots of publicity for our local authored works. Mr Andrew keep up the good work..